it was so great of so many of you to weight in on my baby and parenting fears, it's made me feel better that it is so common to be apprehensive about having another baby. any change is scary, i guess, especially when you have some inkling as to what you're in for. the last couple of months, i was actually feeling better about potentially having another baby and i think getting the flu the other week really freaked me out about being pregnant again. i just can't imagine feeling sick and exhausted for weeks on end again and this time with someone else to take care of all day and night. it'll be a while before we really get serious about having another baby. i don't know how long, sooner or later, but a while anyway. and i still may not feel completely ready when it happens, i'm sure i'm always going to be a little bit terrified, but that's life, you know? that's what it's all about. no rush, but i don't know if there is ever a right time. Yoy have a wonderful attitude about this Leslie. And you're so right about the being terrified bit! Have fun with that gorgeous little girl of yours. I'm sure you will keep inspiring us all with your amazing quilts. I have a seven year age gap between my first two. It took me that long to get the courage to go again - the second time around I found it all ran so smoothly. I put it down to being experienced HA! Lulled into a false sense of security I went for round three and found that each baby is so different. She was tougher than the first!! But by the then I had the wisdom to know the tough times will pass. The age gap between the younger two is three years. They are all great buddies but the youngest two are very close. Anyway what I'm alluding to is just trust your own instincts and know that the first year is the hardest. BTW the quilt is AMAZING! I think the second is harder to decide on than the first as you know have a full understanding of what is involved. Oh to be smug and in complete denial like on the first! I think you should give yourself much more credit, you are back at work with a 7 mth old! Most mum's wait a year or so, or work away from home 1 or 2 days a week, look what you are achieving with a baby, I think you are amazing!! But I agree with the others, any age gap comes with hesitation, if I had another they would be more than 5 yrs apart, that worries me more than 2 close together! 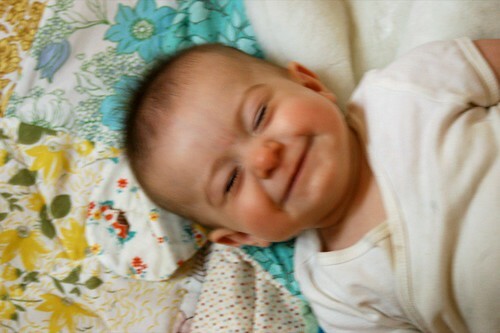 And that is such a cute pic of Mae, she looks like such a happy baby! you'll know when it's time. and it will be wonderful. Oh, I was desperate to weigh in on the debate after your 'Thinking post'. But I had a sort of 'who am I to say' reaction. Besides, others seemed to say it so well. I will say, the things you wrote about resonated with a great familiarity. Having come out the other side of some of those experiences, I reckon, most times, things just work out in the wash.
She's just so gorgeous! As for being ready, I'm sure you'll just know. I find having a baby quite a scary prospect. Am waiting for #1 to arrive any second now. And am constantly worrying. Btw, I like your blog and your dolls on etsy! I just had my second baby (she's 4 weeks) and my son is nearly 6 years old. I wouldn't change their spacing for anything... it's been absolutely wonderful - a true joy! And I couldn't have imagined having them any closer ... I guess all those years of secondary infertility where so that I got these two kids, spaced this far apart. Like I said - perfect... everything happens for a reason (I trust in that now more than ever). You'll know when you're ready. No rush. I'm a little late to chime in here, but wanted to say, that is SO normal to be anxious about it. Our first was unplanned, and while I knew I wanted two, I was like HOW will we ever do this? Now my son is 3 and our second is due in July. I have a tiny bit of anxiety at the changes, but nothing like the fear I felt a couple of years ago. You'll now when the time is right for you. I have to say, I think that 3 1/2 years spacing is going to be just right for us. That little face is so delightful! I would want to tattoo that picture to my arm to look at it all the time! I personally found that #2 was SO MUCH easier! Once they have each other, you aren't the only source of entertainment anymore. I thought that made all the difference in the world. it for anything in the world.